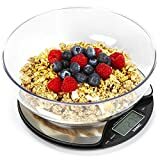 This page is updated regularly with some of the best selling and highly rated kitchen scales that are currently on offer. These deals sell out fast so make sure you don’t miss out on these bargain prices. 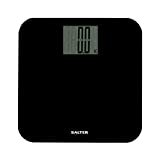 This scale is one of Salter’s best sellers and it’s easy to see why. Stylish and practical, these Salter Digital Kitchen Weighing Scales in black scales will look nice on any kitchen worktop. 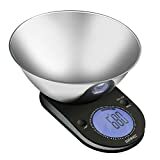 With an RRP of £19.99 it is good value, and it also benefits from having many great features such as the ability to measure multiple ingredients (including liquids) in one bowl/pan, an Aquatronic function for measuring liquids, easy to read LCD display, and a maximum capacity of 5kg measured in 1g increments (or in Imperial if you prefer). It is easy to clean and store too. They are also available in White and Silver. 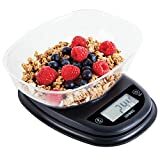 With high precision sensors that deliver exact results every time and a clear readout LCD display these kitchen scales with bowl from Etekcity are an essential tool for any kitchen! Features include tare and auto-zero functions, a sturdy, detachable 2.15 litre stainless steel bowl, ambient temperature sensor and kitchen timer. It has an auto-off function to save battery life and it can weigh up to a maximum of 5kg (11lb). The RRP of these kitchen scales is £18.99 – an excellent price – and even better when on special offer! These Duronic KS5000 digital kitchen scale employs 4 high precision sensors to give you a prcise reading every time. Combining ingredients is easy, and with a 5kg capacity, large display with backlight, tare function and a large detachable mixing bowl, it is simple to prepare and weigh ingredients accurately. Other features include a tare function and the ability to measure in increments of 1g/0.1oz/1ml/0.1fl.oz. 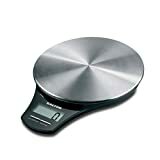 This kitchen scale has an RRP of £49.99 and includes a Limited 2 Year warranty. 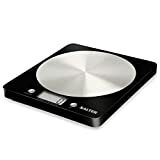 If, like Heston Blumenthal, you seek precision in your baking and cooking, then this sleek and stylish kitchen scale from Salter is perfect for you! The Heston Blumenthal Precision Scale holds up to 5kg and provides 0.5g precision. 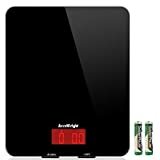 It is very easy to clean and has a neat slim design which makes storing these kitchen scales simple. It has an Add & Weigh facility for measuring multiple ingredients in the same bowl and Salter’s own Aquatronic function for measuring liquids with accuracy. The large display is easy to read and you can switch between metric and imperial measurements at the touch of a button. These scales have an RRP of £34.99 and can often be found on special offer.